Today in History–July 8–the Library of Congress features the Great Depression, as the Dow Jones Industrial Average fell to its lowest point on this day in 1932. During the Great Depression many families lost their homes because they could not pay their mortgages so they sought alternative forms of shelter. 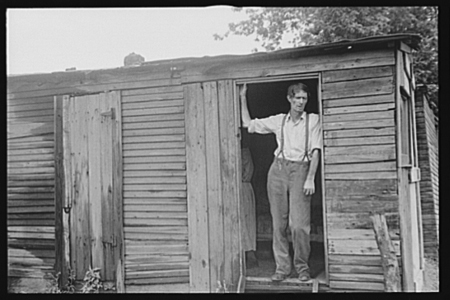 Groups of these makeshift houses were often referred to as Hoovervilles (see image above), named after President Hoover, who was blamed for the problems that led to the depression. Learn more about the Library’s depression-era resources by visiting the Today in History section, then click the links below to access even more resources.